Our economy is at an interesting point. One I haven’t seen for years now. Essentially, we’re in an earnings recession, even though the official data says we’re still in an economic recovery. So what’s happening? You can blame China and oil. As China slows down, so does the commodities sector. And as commodities like oil plunge, producers of said commodities take an earnings hit. When you look at the U.S., almost all of the profit pain is in the oil and commodities patch. In fact, if you look at margins — which tell you how profitable every dollar of revenue is — what you find is that margins are actually moving higher across most industries. This isn’t what you would normally see in an economic recession. 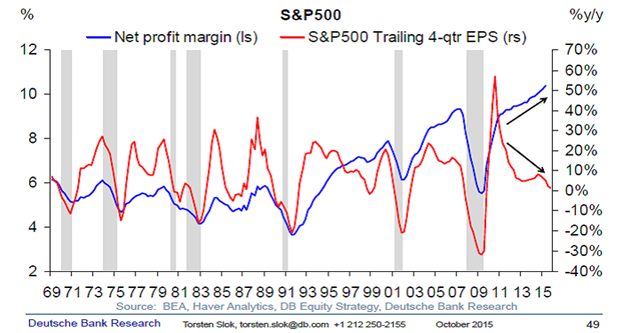 When recessions are about to strike, we see margins go down as manufacturers and service providers lose pricing power. Instead, we’re seeing profits go up as the cost of raw materials falls. And the service sector in the U.S. — which makes up 85% of the economy — is actually growing. So while we may be seeing some trouble in the U.S. economy, it’s still not broad-based enough to dip us strongly into negative growth. At present, most of the earnings warnings are coming from some banks (due to global exposure) and commodity companies (for obvious reasons). But we’ve still seen 66% of the S&P 500 beating earnings expectations. That’s not to say earnings aren’t declining outright. Revenues overall are down from $3.43 trillion in the second quarter to $3.39 trillion in the third. Over 60% of the companies that have announced earnings so far actually missed revenue estimates. Still, most companies are managing declines better than shareholders expect. And Thomson Reuters is calling for a $4 million decline in earnings this quarter. That said, if everyone thinks the news is going to be bad, then we’re going to have to see some really awful earnings for investors to keep selling. That might give us an indication that sentiment has gotten too extreme over the short term. Yet we should still expect to see some turbulence over the next few weeks. Some companies will, after all, announce great earnings. But the ones that don’t could get investors thinking the recession is officially coming. And that could easily ramp up selling. Generally, we know that earnings are manipulated to some extent by most companies. In other words, they announce numbers that they can beat. So an earnings beat isn’t a shock. It’s when that beat doesn’t materialize that causes the drama. Revenue, on the other hand, is something a company can’t control as much. They can’t force a sale to happen. Either that sale takes place, or it doesn’t. And when it doesn’t, revenues fall. Bottom line: Put on your seatbelt. We’re going to have a bumpy week. You can take a look at our open portfolio here. All of our positions are doing well. And we’ll have another play to add once you get your monthly issue in a few days.